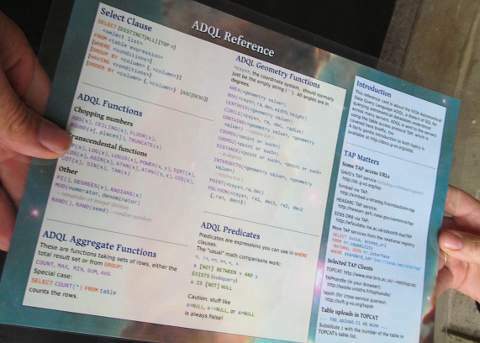 The AQDL Reference Card (pdf) briefly gives an overview of the SQL dialect used in the VO. It is most useful when used with a more gentle course, e.g., our short ADQL course. The material is distributed under the Creative Commons Attribution (CC-BY) license. If you change the document source (currently Scribus 1.4), please feed back your changes (or inquire about SVN access).